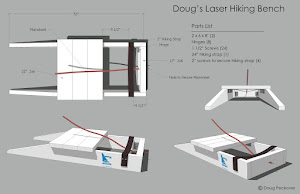 Laser Cheat Sheet. So, you're sailing on a lake trying to hold your position on the line and the race is about to start. You look ahead and see motorboat waves coming when you least need them. Most people think, "These could not come at a worse time." I think, "Goody." Sailing at night taught me something that was completely unexpected - how to sail faster through certain types of waves. This is what works for me - please post your own comments if you disagree. First, a review: all boats are good in some types of waves and bad at others, and it has to do with the relative size of the boat and the waves. Motorboat waves are bad for Lasers because they creates a fore and aft rocking movement, and the slapping of the bow into the waves can kill the speed of a Laser. If you can stop this rocking you'll come out of these waves faster. So, let's try an experiment. You have two eggs at room temperature, one is raw and the other is hard boiled. How can you tell which one is which? The answer is that you spin them - the one that stops sooner is raw. So, I'm guessing that something that has a center of effort that moves loses its momentum, while the one with a fixed center of effort keeps its momentum. The boat has to "know" where you are, so I used my mainsheet hand to grab the gunnel and stiffened my arm so that my body was now a part of the boat. Body movement in and out had no affect. Movements fore and aft work, but they have to be random. 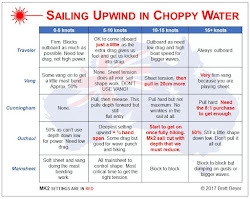 The best way to do this is look at different things from different positions - under the boom at another boat, up at the sail, back in the cockpit, behind at the boat on your hip, etc. all with my arm still stiffened. When I do this, I'm sure that no one understands what I'm doing because these are all natural movements sailing a Laser. But with my arm stiffened and making sure that my movements are random, my Laser has the same problem keeping the slapping motion that the raw egg has spinning. It's absolutely amazing, and feels like the waterline is longer as my boat goes though certain types of waves. The result in our starting example is that I come out of the motorboat waves with 50% more speed than the boats below me or on my hip. What an awesome way to start a race!! Great tip. I will try it. Two other questions on dealing with motorboat waves. 1. If the waves are coming more from the side of the boat than ahead, it seems to me that sometimes you can use them to induce pumping of the sail and accelerate the boat that way. Is that your experience? 2. If approaching a set of motorboat waves on the open course, would you ever tack to avoid taking them straight on the bow, or would you use your random body movement trick? 1. 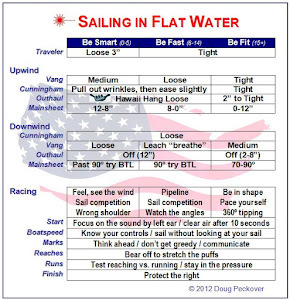 I prefer to use my weight to exaggerate the pressure on the sail without pumping, and waves coming from the side stretches out the distance between them. Both of these are good. 2. Given the option, I always take the path of least resistance. The random trick helps with the waves when there is no other option, which is why I use the example of coming off a starting line. Hi Doug ..cheers for your frank knowledge - great to read and try. On the random movements. Do you move your hand/stiff arm along the gunnel or is it fixed with just your feet/torso moving back about? What works for me is keeping my hand in the same place and then bending my elbow as I keep my arm flexed to stay locked in. Very little fore and aft movement is needed, and nothing below my waist moves. Let me know how you go. Great post - I remember Dr. Laser saying the same thing regarding random movement being very fast in lumpy conditions. Thank you. There's still lots of speed to be discovered. Any chance for a video of it? Looks like your doing well at the worlds.